We are now taking reservation for 2019 mated Buckfast queens. £5 deposit is paid to reserve your queen, the balance of £34 will be invoiced when the queens are ready. Please do bear in mind the dates are provisional and the weeks may slip back depending on the weather. As soon as we have information on dates we will email you with an update. The Buckfast bee, often referred to as the renowned Brother Adam bee is a cross of many strains of bee. It has a colour variation that is quite unique. The colours can vary from very light to stripy to very dark, this is no doubt as a result of the wide genetic pool used to keep the variability of the Buckfast strain. Out of all the good traits the buckfast is breed for colour is not one of them. These Buckfast queens qualities include that of being very prolific with a low swarm instinct, gentleness and a high resistance to diseases. 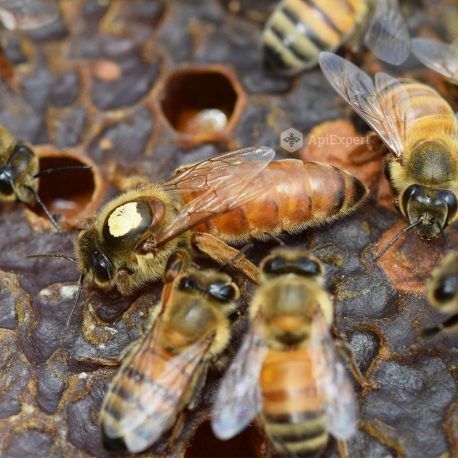 They produce less propolis than other races, overwinter very well using less honey stores. They have a boundless capacity for foraging and build up rapidly in the spring. They maintain a strong colony during the summer and their gentle manner allows the beekeeper to work with minimal use of smoke even opening the hive in bad weather. 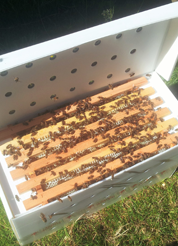 Swarming is one of the biggest challenges we face as beekeepers. Even with a quality buckfast queen with a extremely low swarming instinct like this one it would be a mistake to assume that they won’t swarm at all. There simply isn’t a strain of honey bee that has no swarming instinct. These F1 Mated are breed by our Romanian breeder. All our queens are naturally open mated. We do not sell artificially inseminated queens (AI).